Forty years ago, Max Mara was devising a code for businesswomen. The so called “power dressing” offered the means to the executive suit; there was no room for self-expression for a Working Girl, since strict conformity was the price for a good career. On the other side of the city, in dark subterranean nightclubs, the fashion punk tribes used studs, straps and chains as a clear expression of their absolute repudiation of the corporate grind. The choice to belong to one side excluded one another. Forty years on, barriers have smashed and boundaries blurred. The tip and the bottom of the Fashion pyramid are mashed-up in mutual influences. The Max Mara woman can’t accept those rigid terms anymore, she demands success on her own terms, and she wears what she wants. Her determination and defiance is expressed through a don’t-mess-with-me coat and a tough look, often declined in leather outfits. A feline attitude, a gothic grit and lots of glamour explicate the Max Mara message: classic doesn’t have to be conservative. The woman hasn’t changed since she began her long march as a Working Woman, yet the brand does, in order to sync with “l’air du temps“: the woman can be the rock star, the boardroom executive and the screen siren all at the same time. The Max Mara clothing have a purpose: to empower. And no doubt a woman wearing a Max Mara coat feels like a powerful world conqueror. For Fall/Winter 2018, the Italian brand proposes heavy woolen tailored coats, leopard spots, fringes, Prince-de-Galles, shimmering embroideries, voluptuous drapes and tough leather garments. 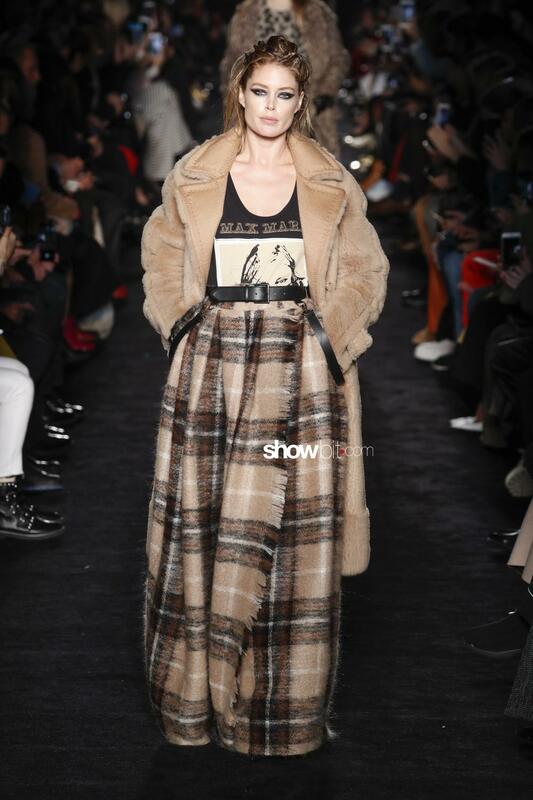 The T-shirts graphics were designed specifically for Max Mara by the legendary artist François Berthoud.